After my last post about the 30 day declutter challenge I decided to start my challenge backwards since I was already working on downsizing. I pushed hard with this and we made many trips to donations as well as packing up some things for our children to be kept or sold since they are more sell savvy with ebay and new ways of selling things. Just before we started this we had gone for a well check at the doctors office, one of Charles well check where you have blood work the week before then go the next week to the doctor. Well the week he went to the doctor we picked up a respiratory infection while at the doctors office. This is the second time this year we got sick after being at a medical facility. It was a bad bug, a bacterial infection which led to early pneumonia for me and two different trips to the doctor and two rounds of antibiotics and other medications which I am still on. I was flat out! No hand washing laundry, no repaired washing machine, it turned out that the washer needs complete new insides and it could be a battle to get them to fix or repair. The good news is we found an old regular washer for $80.00 and that is what we are using for now and I cannot wait until I am well enough to go back to hand washing because I miss that really clean laundry I can only get by washing by hand. Lesson learned for us, we will now wear a mask when going to the doctors office, I don't care what other people think. We cannot trust they are doing a good job with infection control in the doctors offices. You know, it really is our responsibility to take care of ourselves so we must take precautions. I can tell you that downsizing into a tiny space is really difficult. My brain is exhausted thinking where to place things and what to get rid of. I have been through our clothing three times now. This washstand has taken on a whole new purpose which is being used daily since the main bathroom is in the other apartment. We have the outdoor bath house for now and we will be putting in a new toilet in the near future on our side. If you are not following this, just look at the last two posts. I am finding beauty in the small things and I have an appreciation for textiles from the past. We are still working towards greatly reducing plastic in our home and we are still working on saving water. It is hard work to reduce water consumption but it can be done and should be done. We have surprised ourselves at just how much less water we are using and how that encourages us to use even less. Each year we have reduced our electric use and this started when we started living more like the past. We moved from a small closet to a smaller closet as I had mentioned in the last post. This closet holds all of our winter and summer clothing. We were going to reduce our clothing by a number of items such as 50 items each but then I changed that to keep however many items will fit comfortably into the space we have to use. As you can see my clothing on the lower bar is a bit tight so I will reduce this more. To the left what you cannot see are my sweaters and vests etc. Charles made a small hanging area for dresses and my night gowns on the right side. Charles has the upper bar above mine. He has short sleeve shirts to the right, pants, long sleeve on the other side of the pants then his vests and sweaters to the left. Our bedroom is in the room that was the sewing room. I left this shelf up and when we finish I will paint this and most likely make a pretty textile simple skirt for the edge of the shelf. Part of living old fashioned is making homemade gifts and items used in the home. To do this we need tools so I will not be parting with tools. I have been donating and giving away duplicates. If it has a purpose it can stay as long as it fits into a space that does not crowd so it cannot be cleaned easily. As I have spent much time in bed lately I have had much time to think and mentally place things. Also we need time to reflect on what is our goal. We want to continue to have an interesting old fashioned life. Keep the amount of electricity and water to minimal use, plan proper, simple meals and keep our grocery budget in check. We are trying to not purchase anymore disposables of any kind. I have parted with some of my heavier pyrex bowls since my hand grip is not the same and I find stainless steel bowls to be lighter. We want to continue to grow food in our yard which we know now much of it needs to be in raised beds. I will do a fall garden update to show you what we are doing when we get this more organized. We like to share with others and if there is not enough harvest to share, then we can share seeds, cuttings and plants. Sometimes we might not do well here during a season but something shared with someone else might have a better harvest due to their soil. Ginger and turmeric have been warmly accepted from some of Charles acquaintances. Another important thing to do is to share knowledge and teach those that want to learn to do things the old way before the skills are lost completely. I was recently asked about our diet and also if I make cake? Yes I do make cake. I actually have a post on this chocolate cake under my cooking from scratch section. 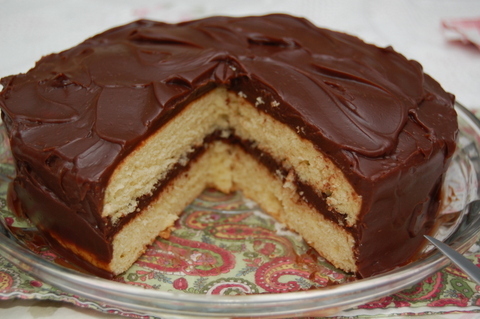 This is homemade yellow cake with boiled chocolate frosting. I also make hot milk cake, pound cake, carrot cake and Italian cream cake. About our diet, the latter part of last year Charles and I went on an elimination diet to try and cure Charles psoriasis. We stayed on this diet for about three months then started reintroducing foods back into our diet. We both lost a good bit of weight. We came to the conclusion some foods trigger worsening of his skin issues and weight gain. Some food causes inflammation in both of our bodies and much of that causes weight gain. Reduce the inflammatories and reduce the weight is what we found. Cakes and pies are reserved for special occasions. I love to make and eat puffed pastry.... But this is now only for special occasions. We are eating more seasonal. This pear pie was made during pear season. I can make preserves and canned pears during pear season and that one special pie occasionally. I have reduced the amount of sugar in many of the recipes. We have made a drastic change in our diet. We are trying to unlearn the way we were eating and not focus on the foods of today. We are focusing more on what is better for us and trying to keep it more simple. In today's world food is romanticized and there are even television shows on food competitions as if we need more competition. If our generations before us could see what food has become they would not believe it. We should be eating for our health. We have been pushed and prodded into purchasing food. Look at all the places to eat, the amount of processed foods stacked on the isles in the grocery store is overwhelming. No wonder there is an obesity problem and why people are actually under nourished after eating so much food. We have generations of children now that don't even like the taste of real food because they have eaten only processed and fast food. Charles and I only eat two meals per day now and we try and eat our colors. The evening meal has been replaced with cheese and crackers or a smoothie. Sometimes is is a small serving of frozen chocolate chips. We eat simple basic meals and I have a two week menu that I repeat (when all goes well). We are not perfect, we occasionally take on too much to do and will pick something up already prepared but we try and make that something that is not bad for us. We try and find somewhere that serves vegetables but even that can be doctored up with too much sodium, fat and salt. We do eat meat but we eat much less meat than we did. We did not realize that we were actually eating meat every day and often meat at least twice a day. We found that was not good for us so we are more balanced with the frequency and amount we eat. We try and eat more vegetables and we have meatless days several times a week. This meal above used to be a frequent meal. It is pate chinos. Potatoes, onions, corn and beef. We only eat this about once a month, if that often. We can still enjoy this meal because it is an old family favorite but this combination is not a great combination for digestion. I started adding carrots to this dish and in the past would fill my plate but have learned portion control now. Now when I do make a cake the next day I slice the cake into serving sizes and I put it in the freezer. This way we do not overeat on cake and take out two pieces occasionally. We normally eat our main meal during lunch time now. This has stopped my acid reflux issue. Since not eating our main meal in the evening I have had no more issues and another thing I found is reducing sweets has also helped to get rid of this issue. We also greatly reduced our nightshade vegetables. (the photo above has potatoes so that is a nightshade) Tomatoes and eggplant we eat less frequent because they are also nightshades. We stopped eating them completely for three months and now we eat them occasionally. They are only on the menu occasionally. Some people can eat these foods with no problems, we just happen to have a problem with them. Saying this, we found that now that we have reduced our inflammation we can eat many of the foods that were once bothering us.